Between June and August this year, CNN has conducted a global study labeled “Power Of News And Recommendation” (POWNAR) based on an online survey with 2.300 respondents. The goal was the analyze the impact of shared news on the social web from an advertising perspective. And the results are pretty interesting! According to the study, brands benefit a lot from advertising in context of content that is being shared through social media channels. Users who received news articles from their social web contacts were 19 % more likely to recommend brands that advertised on the source website, and 27 % more likely to favour that brand themselves. Another result from the POWNAR study is that video pre-roll advertising has a particularly high effectiveness when shown around news content shared in social media compared to display banner advertising. The results of this study are indicating that it is beneficial for advertisers to be present on websites that are being shared through social media, and hence that publishers are recommended to increase the sharability of their content, which subsequently will lead to higher ad effectiveness and more companies buying ads. Of course, this proves us at Twingly right for providing newspapers and other media sites with our Twingly Blogstream widget, which shows incoming links from the blogosphere next to an article, and which at the same time links back to the bloggers. This gives everyone who runs a blog a huge incentive to share newspaper articles with their readership. By using Blogstream, content sites not only do increase the number of weekly bloglinks by on average 250 % within a few weeks, they – according to the POWNAR study – also increase the effectiveness of ads shown on their sites. CNN did also look at what kind of content has the highest chance of getting shared on the social web: 65 % of content analyzed for the survey comprised of ongoing stories, 19 % were breaking news and (only) 16 % fell into the “quirky or funny” category. Furthermore, the study found that visually spectacular content, stories about science and technology as well as human interest stories and money-related content are working particularly good when looking at the number of shares online. The POWNAR study also proves what is already common knowledge: A small percentage of all people online are accounting for the majority of articles shared. In this case 27 % of all sharers account for 87 % of all news stories. Platforms most frequently used for sharing content are social media networks and tools such as Facebook, Twitter and YouTube (43 % of all news shared), email (30 %), SMS (15%) and Instant Messaging (12 %). So what’s the overall conclusion? Make your content as sharable as possible, because it will increase the effectiveness of your ad inventory and make your advertisers happy. From time to time we take our microphone (aka smartphone), meet up with interesting people from the Swedish web sphere and ask them a lot of questions to get new insights and broaden our horizon. In May we interviewed Alexander Ljung, the Swedish CEO of Berlin-based music startup SoundCloud. Now, a few days ago, we met Sorosh Tavakoli, the CEO and founder of Videoplaza, an expanding web company with roots in Stockholm but active on markets across Europe that is specialized in helping media companies to monetize videos on the Internet. And as you probably know, web video is exploding. Hi Sorosh. What’s the most fascinating aspect of working with online video? It’s the shift from what we call “Old TV” to the “New TV”. The Old TV meant that there was one broadcast and the same commercials for everybody. The New TV is delivered via Internet infrastructure, dynamic and very personalized, which means that the serving and targeting of advertisements works in a totally different way. You can show different ads to different people. How this is changing the media industry is very exciting and we are happy to be at the core of this development. What exactly are you guys at Videoplaza doing? We have developed an ad server solution for online video. Media companies like TV channels or newspapers can use our technology to embed different types of ads in their streaming videos. While we take care of all the technical process and make sure that there is always compatibility with the platforms being used to distribute the content, the media companies can focus on what they are best at: Produce and get the content and manage the advertising sales. What is the biggest challenge for the the New TV? The variety of platforms is a challenge. Web video is accessed in so many different ways, starting from regular computers and notebooks, media PC’s, Tablets like the iPad, mobile phones, via Internet-connected TV’s, gaming consoles like Xbox or Playstation as well as through dedicated streaming video boxes (soon there will be even “Google TV” and, if rumours are true, a new Apple TV platform). Instead of simply making sure that the traditional TV broadcast can be monetized properly with the help of ads like in the “good old days”, there is now a huge amount of platforms with different specifications that needs to be taken into consideration. Tell us the background story of Videoplaza. During my studies at the Royal Institute of Technology and the Stockholm School of Economics I did a research project at MMS, a company that does audience measurement of TV programmes in Sweden. The outcome of the project was a report about how people consume moving images, including all the digital methods of watching videos. Through MMS I had the chance to present this to the major TV stations in Sweden, and I learnt the fact that monetization of online video will be a huge challenge, a challenge that needs to be tackled in order to be able to develop legal alternatives to torrent and other illegal download sites. From that moment my brain was working. I wanted to help the media industry to find a way to bring content online and to earn money with it. Together with Alfred Ruth and Dante Buhay, the three of us thought about possible ideas, presented them to our contacts in the industry, and eventually found a solution that one big Swedish TV firm was willing to try! Voilà: In January 2008 we had our first client, started to develop the product and launched it two months later. Yes, that was a pragmatical decision: Sweden is small. After half a year we had signed up most of the major Swedish TV/media companies as clients. In order to continue growing we had to look outside of Sweden. We started with the other Nordic countries. UK and France followed, and our next market entry will be in Germany. Most of the future growth will come from markets outside of Sweden. Our team has become pretty European as well and in fact we have a “No Swedish policy” for all communication. What are your favourite apps or services (besides everything that is related to online video). I like to check-in with foursquare. Actually me and my wife have a little competition there. But otherwise I have to admit that I’m not this kind of person anymore that in front of the computer for hours experimenting with new apps just for the fun of it. I’m always more focused on the business side rather than on the feature side. How can a service generate revenue, what’s the business model, how will it scale? In the end, if a web company can’t make money, it’s gonna die. And the final (and for us at Twingly) very important question: Do you read blogs? Among the Twingly users a rather big number of people runs a blog. The total population of bloggers around the world is estimated to be somewhere between 100 and 200 million. How many of them are dreaming of earning money by blogging? We don’t know, but for sure it is more than a minority. Most users (hopefully) know that they won’t become rich by blogging, but it’s definitely possible to earn some cash to go to a nice restaurant or to buy a new gadget from time to time. A few bloggers even manage to make blogging pay all their bills. In the end, it’s up to each and every person’s talent and determination. There are several ways for a you as a blogger to create a revenue stream. Here are five strategies to make money by blogging. This is the most boring and probably least effective way of monetizing your blog, but it is the one that costs you very little time. By signing up for an advertising program like Google AdSense, you can integrate ads (text or display) into your site, based on what content you are generating. Each time an ad is clicked or viewed, you earn a few cents, depending on the program. While almost every site can join, the outcome is usually pretty low, especially if your blog doesn’t have many visitors. Furthermore, despite different targeting techniques, those ads are not always properly matched with your content, and often they don’t look that nice either. Still, it might be worth a try. Affiliate is another category of online advertising, where you are not getting paid for impressions or clicks, but for actions, like when somebody buys a product or signs up for a service. At a first glance that might sound unattractive to you, but for some sites, affiliate marketing works out pretty well. The potential of affiliate is dependent on your blog’s content. Do you write about things that are being sold, like for example books or cameras? Then you could sign-up for an affiliate program and use affiliate links in your blog posts to get a commission every time a visitor from your site buys something after following a link. Let’s say you blog about a very specific niche topic where you are a real expert in. Even though you maybe don’t have many visitors, the people that are coming to your site are highly passionate about your content and engaged in comment discussions etc. Instead of putting ugly irrelevant ads on your page that no one pays attention to, you could try to get sponsored by a company that is interested in reaching out to your highly specific target group. Even though you only have a few hundred visitors per month, the sponsor knows that each of those is part of the target group and therefore potentially interested in the company’s product/service. This approach will cost some time since you need to get in touch with companies and offer them a sponsorship of your blog. But if you find a company willing to pay you a monthly amount for in return getting their logo on your site, it could help you earn some money and will make your blog look really professional. If you are a good writer and an expert in your area, there might be other content/news sites that would benefit from getting your articles on their site. This is called syndication and not that common yet among blogs. But since newspapers are faced with declining ad revenues and have to deal with budget cuts, it’s not unlikely that more of them will try to get affordable content from bloggers in the future. Keep your eyes open for possibilities! This is an indirect way of monetizing your blog. Instead of getting paid for what you publish at your blog, you get hired for external consulting in the field where you have proven that you have smart things to say. This approach is very long term oriented and requires a lot of patience and persistence, since you first have to build a reputation. When you feel that you are ready to take your blogging career to the next level, watch out for consulting opportunities and make it easy for your readers to get in touch with you. You could also write a blog post informing your readers that you are available for consulting or speeches in your specific area of expertise. As you see there are different ways of earning money with your blog. All of them have in common that you need to be good. You need to be quality-focused and you should be passionate about the things you write about. This will increase your chances of success tremendously. Do you want to share your experience of monetizing your blog? Today we’re excited to introduce a new business area for Twingly – sponsored realtime services for media web sites. First up is a special version of Twingly Live for the Climate Conference in Copenhagen, #cop15. This Twingly Live is integrated directly at the Swedish news site DN.se and is sponsored by the energy company Vattenfall. It is the very first project testing our new sponsorship model for realtime services on media web sites. We believe this solution is showing one of many possible ways into the future for media web sites, since it both connects the editorial content to the real time web and create new revenues for the web site. This is something our new rock star Annie will work on in the upcoming months, so please contact her if you’re interested in a partnership. The Cop15 Twingly Live is showing news articles that tweets with the hashtag #cop15 is linking to. As always with Twingly Live and Channels, it’s totally realtime. And of course the service can be customized depending on the needs of our future partners. 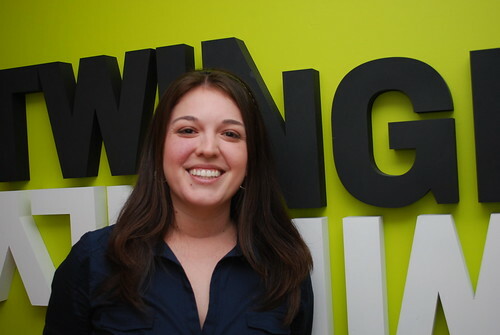 We’re pleased to tell you about another top notch addition to the Twingly team: Annie Sarabia is joining us as a Business Developer. Annie has been working with advertising agencies in Austin, Miami and New York within media. She will now operate from our head office in Linköping. She will both work with our existing European markets as well as the US. Her experience from media planning will be crucial for us when we now start to work with advertisers and our media partners to monetize the realtime web in new ways. This is a new business area for Twingly ahead from now on and Annie will start work on some different business development projects together with the rest of the team. One part of that project will be to start building relationships with media agencies. We’ll recruit more rock stars to our team in 2010. If you think you’ll fit, please contact us! A new Swedish survey with blog readers on 33 blogs indicate that blogs influence their readers consumer behavior a lot. 58 procent of the blog readers have after a tip in a blog actually purchased the product later, but so much as 42 procent of them think that advertising reduce the trustworthiness of a blog. Another interesting statistic from the survey is that only 12 procent read blogs on their cell phones. How weight the trustworthiness of a blog when it’s advertising on it? BusinessWeek recently wrote about thirteen blogs making heaps of money. These blogs are making most if not all of their money from advertisement. We’re definitively seeing a bright future in blog advertising: it allows publishers to more accurately target their key audiences. However, we believe that youâ€™re not going to need a blog with hundreds of thousands of visitors to make money. â€œThe Long Tailâ€ means that the future is not to be found in the mainstream, but rather in precisely targeted audiences. Many advertisers will be better off putting their money in highly specialized blogs within their particular sector instead of paying for banners on mainstream media where only 0-2% of the audience has any genuine interest. Businessweeks article about blogs that make big business. Businessweeks pictures of the bloggers.